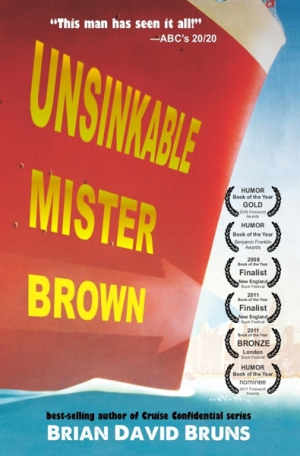 “Ships destroyed lives,” says Brian David Bruns, author and narrator of Unsinkable Mister Brown, and yet, he’s attempting the opposite: creating a life at sea for himself and his girlfriend, Bianca. What begins as a whirlwind romance in Romania leads Bruns to become a cruise ship waiter, an arduous existence that Bianca has born for years. The grueling hours leave them little time together, and he quickly learns that she becomes a different person at sea. The longer he remains on the ships, the more he begins to wonder if any couple can transcend the strains of a water-logged existence. hardships are secondary to the woman Bruns endures them for. With a candid, no-muss style, Bruns shows just how smitten he and Bianca are with one another, though they’re not without their jokes and stubborn streaks. Beneath the playful jabs and willful tempers is a force of gravity that binds them, even when the waves get rough. an ample dose of funny moments to balance all the adversity and chaos, of which there is plenty. After years of climbing the ranks, things begin to fall into place, but then Bianca starts to pull away, both reluctant to give up her economic independence and haunted by a secret past she refuses to reveal. says of himself and Bianca, “We, too, dared to demand against the sea.” This daring spirit resonates throughout the narrative, ringing true for anyone who’s ever defied his circumstances and demanded something more.